Sorghum: Properties, Synthesis and Applications. 2019. By Valentin Missiako Kindomihou (editor). Publisher: Nova Science Publishers, Incorporated, New York, USA, ISBN1536144053, 9781536144055. 278 pages. The applications of sorghum, which have significant impacts on human and animal development, have recently increased. This book includes chapters derived from original research and the synthesis of current knowledge on specific topics in the field. It is an original collection of research findings or summaries of articles from around the world that are part of discussions on the status of sorghum and its applications in various areas of development. This volume addresses physiological, ecological, functional and genetic foundations of sorghum through the examination of theories and case studies that explain various properties, synthesis and applications. The chapters address, respectively, sorghum attributes, heterosis association and molecular mapping for grains traits, ecophysiology, reproductive competence, molecular mechanism of flowering time control, sensory and nutritional properties, mechanisms involved in allelochemical biosynthesis, and applications of bioactive compounds, i.e., polyphenolic and acidic phenolics. This book offers essential approaches including: (i) A generic and rapid way to combine the diversity of single nucleotide polymorphisms with heterosis, which facilitates the dissection of the molecular mechanisms underlying the quality and quantity of grains in an important sorghum crop; (ii) the principles and processes of extrusion in order to obtain grains of good sensory and nutritional characteristics; (iii) the indicators in assessing the role of sorghum as a source of energy in the productivity of poultry farming systems; and (iv) some characteristics of root and foliar responses to water stress of a genotype amenable to genetic modification. It also makes a sweeping analysis concerning the progress of current research in the floral transition of sorghum and the photoperiod response. The final chapter highlights the importance of bioactive compounds of sorghum species, mainly in fighting diseases related to human nutrition. Case studies from around the world were reported, giving readers a real view of the extent of sorghum properties along with real-world applications. This book can be used as a reference for students, scholars, professionals and political decision-makers involved in the study and management of sorghum. This book gives to readers a real view of the extent of sorghum properties along with real-world applications strategies. It provides references to students, scholars, professionals and political decision- makers involved in the study and management of properties, synthesis and applications of sorghum. Chapter 1. Properties, Synthesis and Applications of Sorghum: The Manna behind the Rustic? About the Publisher, Nova Science Publishers, Inc. Founded in 1985 in New York, Nova Science Publishers, Inc. has become one of the leading STM (Scientific, Technical, and Medical) publishers worldwide. Their publications include printed (hardcover and softcover) and electronic Books, Journals, Conference Proceedings, Handbooks, Encyclopedias, Edited Collections and Series Collections. Currently, NOVA publishes over a thousand new books every year by scientists from the top universities and colleges from around the world. NOVA has remained at the forefront of academic publishing as a company that embraces the best practices and technology to deliver unique science books, journals, series and eBooks. Their transition into the exciting world of online publications was a seamless and natural integration, an extension of their vision to publish the best works by outstanding scientists worldwide, and to make them accessible to as many people as possible. Nova publishes a wide array of books and journals from authors around the globe, focusing on Medicine and Health, Science and Technology and the Social Sciences and Humanities. They publish over 1,500 new titles per year by leading researchers each year, and have a network of expert authors, editors and advisors spanning the global academic community in pursuit of advanced research developments. NOVA has representatives, agents and distributors in virtually every country. They distribute review copies upon request, provide advertising for academic journals, are featured in specialized catalogs and are present at trade shows internationally, including the London, Frankfurt and Beijing Book Fairs, as well as many US and international academic book events. The Nova Science Publishers Team values and continues to develop their long term cooperation with leading and respected authors and experts from from around the world, particularly in the academic community. They are proud to have been the second most multidisciplinary publisher in the World based on the BKCI Coverage from 2005 to 2012. As NOVA continues to cross milestones with new discoveries, their commitment to serving the world academic community has remained unchanged from the day of inception thirty three years ago. 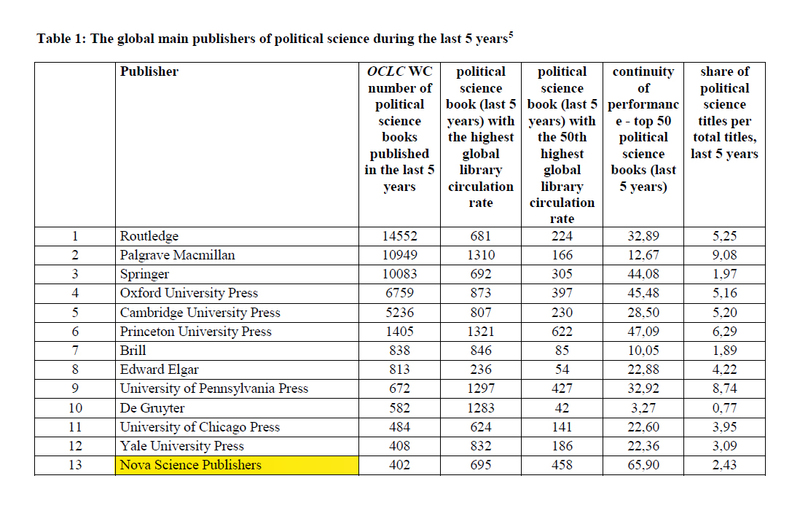 For more information on Nova Science Publishers’ latest ranking, please click on the image below. To Contact the Publisher, NOVA SCIENCE PUBLISHERS, INC.